New Release & new features. With version 2.4, we have implemented many little things. But the main focus was on porting to Univention platform. The Univention Corporate Server, shortly UCS, is an innovative base to operate server applications and entire IT infrastructures economical and easy to administer. Since May auralis is now available in the Univention App Center and become more popular since then. Also in other countries. 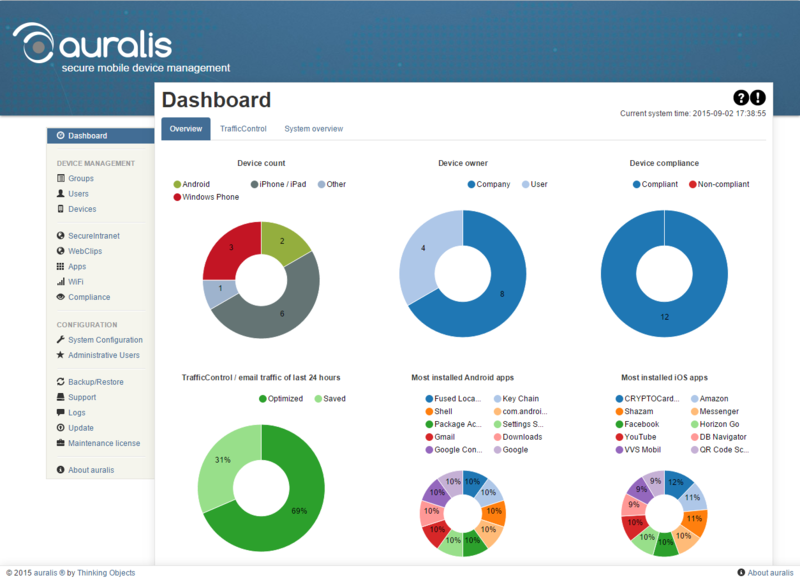 With the enhancements in app management, we now gave auralis two important functions. Apple VPP – the Volume Purchase Program – allows you to buy apps as a company and to distribute them directly to smartphones and tablets. And should the App Store be disabled in your policy, the apps would still installed. Auralis enables the App Store, wait for installation and deactivate it. With compliance rules you define certain policies that must comply with your devices. For example, apps that may not be on the devices, should be necessarily installed or as a requirement a minimum version of the OS. If there is a violation against these rules, you can perform certain actions decide what should happen. Email alert, disable the e-mail accounts on the device or even complete remove from the Mobile Device Management.